Join in on the fun during this Valentine’s Day season as 15 of your favorite romance authors come together for a multi-author hop with prizes! The hop runs from Feb. 7- 14th. 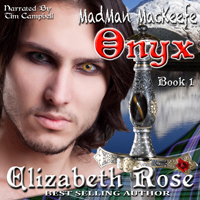 Scroll to the bottom of the page to find the other author links or to enter my contest for a chance to win a $25 amazon gift card or copies of my audiobooks. 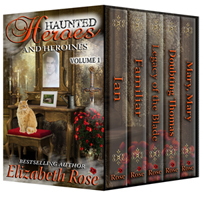 FREE BOOKS: Until Feb. 10th, you can get a copy of Daughters of the Dagger Prequel or my Haunted Heroes Boxed Set #1 for free. And Lady of the Mist is on kindle countdown for 99 cents for a few days as well. Discover the wonderful world of audiobooks this season. 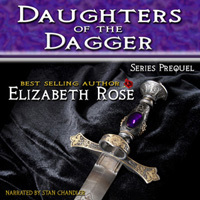 Now available in audiobook form are: Daughters of the Dagger Prequel, Ruby, Onyx, Aidan, Ian, and The Baron’s Quest. You will love the talented and exciting narrations by Tim Campbell, Stan Chandler, and Brian J. Gill. In production are Sapphire, Amber, and Amethyst which will be available within the next month. (Watch for more audiobooks soon.) 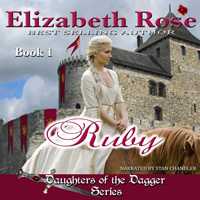 After buying the e-book, (Ruby, Prequel, or Baron) you can buy the audiobook for only $1.99, so why not give it a try! 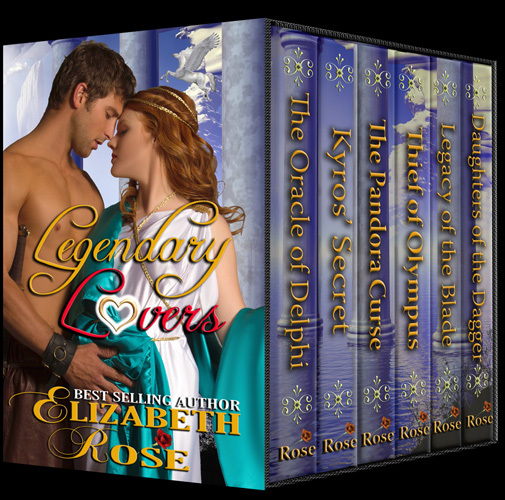 Enter my contest through the rafflecopter below and you will have a chance of winning a $25 amazon giftcard, or one of my new audiobooks! 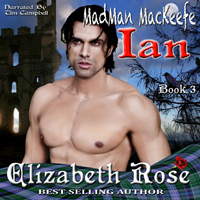 This entry was posted in audiobooks, Contemporary Romance, Free book, Medieval Romance, Paranormal Romance, Uncategorized and tagged multi-author hop, Valentine's Day giveaway by Lizrosek. Bookmark the permalink. I’ve tried them all, but I don’t care for audio books. I have tried ebooks, paperbacks, hardbacks, and prefer hardback books of all forms. LIz, thanks, and I hope you enjoy Legendary Lovers. I’m glad to see you like all formats – so do I. Thanks for leaving a comment. I think audiobooks are the thing of the future. Lisa, thanks for leaving a comment. I haven’t done audio books. When I’ve got time I prefer to read rather than listen. 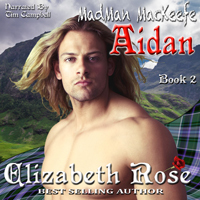 I’m not big on audiobooks but have only tried two thus far….may ultimately change my opinion. Reading will be popular one way or another! I don’t use audiobooks but I know people who do. Ive tried all 3.. I really prefer to hold the actual book in my hand and turn pages. I have tried all but the audio books. I have never gotten into audio. Thanks for the books! I have tried all three, and find each has its own niche…. audiobooks when I am driving or cleaning, real physical books when I am home reading, and ebooks while waiting in lines or traveling. Thank you so much for the free books! I have not tried audiobooks yet, but am definitely open to doing so. Of the other two, I love printed the best, but ebooks are great for being able to read anywhere, at any time. I like ebooks and paperbacks. I haven’t tried audios yet. I still prefer paper, but I read e-books. I am just starting to get into audio. I can’t do audible books because i can’t hear them. My preference is always paperback..i love to hold a book in my hands.. I love paperbacks, ebooks and love listening to audios! I read in paperback and ebooks mostly. Hardbacks aren’t as portable and I can’t get into audiobooks because no matter how talented the voice-over actor, I still feel like there should be more than one person “cast” in the roles, lol. Paperbacks and eBooks. I’m not into audio books yet… maybe one day. I have tried and use all three: ebooks with my kindle, audiobooks, and, of course, my beloved print books. I tend to use ebooks more now, simply because of space. We don’t really have room for another bookshelf and they are overflowing as it is. audiobooks are great for long car rides or chores, but I don’t get to listen to them as often as I’d like. I cannot believe how very many books you’ve written. I find that both amazing and fascinating. I love reading paranormal, fantasy, mystery, and various other genres, so you have many books I’d love to read. I enjoy audiobooks, as well as print books (I’m a collector), and ebooks. I suppose if it’s written, I’ll read it. Thank you for a great giveaway. I have tried all of those forms of books. At different times I enjoy all of them. I like ebooks and paperbacks. I have read with paperbacks, hardcover, and ebooks but not audio. I can’t keep up mentally. It’s a side effect from chemotherapy. I’ve tried all forms and I really like print and ebooks. I’ve only tried audio a couple of times so I haven’t really decided about that form. I didn’t think that I would like ebooks but I really do because I read on my Kindle as I use my treadmill so I walk longer and also, when I’m tired I can increase the font size and continue reading. Now I just realized that I could try an audio book as I walk… And, I love print–just to hold it, admire the cover, read the back and savor the moment and then dive in! Your books sound terrific and thank you for the free books and for the contest! I have tried paperback books and ebooks, though I love paperback the most. I might consider audiobooks though I have on occasion listen to a book on CD. I prefer the tangible, something that I can hold in my hands as opposed to the intangible, though I can see the pros and cons of both formats. I haven’t read any yet, but am eager to start. I read mostly e-books on Kindle. I’ve tried all three. I love audio books the most. To read a book or ebook you have to have time to just sit down and read. I don’t have a lot of extra time. While listening to an audio book, I can do laundry, cook dinner, wash dishes or any of the other million things I have to do. I’m so thankful for audio books. I have tried paperbacks, e-books, and hardbacks and like them in the order I listed them. Portability is important. I gave audio books a shot, but I get distracted while listening. Call me old school but I just love a paper back or hard cover book, but I have read books on my tablet also. I read Ebooks and Paperbacks but I’d consider Audiobooks too. I’ve never listened to an audiobook. I prefer paperback or my kindle when I’m traveling. I really enjoy audio books. Great windshield time. I have tried them all but paperbacks remain my favorites. You have fabulous giveaways. I think that I’ve read most of your books, but don’t have any in audio format.